You know that terrible feeling during a workout where your heart rate is out of control, you breathing is shallow and rapid and you feel like you are going to hyperventilate? What if there was a secret "hack" to getting around that? 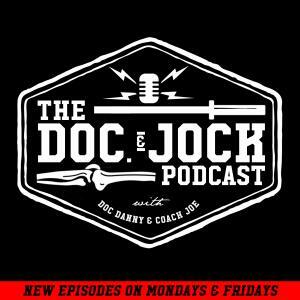 On Episode 206 of the Doc and Jock Podcast we are joined by the legendary Rob Wilson (for the 5th time) to talk about The Art Of Breathing during a CrossFit/high intensity workout. Just like most other things we do in the gym setting their is an optimal way to breath during exercise and those who master it have a distinct advantage over their competitions. Rob Wilson comes from a formal education in manual therapy with 15+ years of experience as both a practitioner and teacher. He resides in Virginia Beach, VA with his wife Thomi where they own and operate CrossFit Virginia Beach. In addition to working with the Power Speed Endurance team Rob is also a member of the world renowned MobilityWod staff under the direction of Dr. Kelly Starrett. Rob’s main sport background is youth martial arts including Jeet Kune Do (the philosophies of Bruce Lee), Judo, Muay Thai, and Maphiliindo Silat and Kali. Like many coastal kids Rob grew up surfing and skating as well and developed an affinity for the ocean and Nature at an early age.